We are in the middle of a small project to install small signs on sites that we graze to help visitors identify the grazing animals. The project was funded by the Postcode Local Fund of the People’s Postcode Lottery and involves simple and discrete signage to be put up and changed as necessary. We have breed notices for many of the animals we graze and we can put these in the frame as they are moved around. We also have general information posters for when the field is ungrazed or where none of our posters are applicable. In the last few days signs have gone up at Hauxley, where we have Hebridean Sheep grazing, and also up on some of the fields at East Chevington. In one of these it was a choice of posters as there are Shetland sheep, an Exmoor pony and two Highland ponies. The Exmoor poster seemed a little confusing with the mix of ponies so the Shetland sheep poster was the one that was eventually installed. Our sheep flock is a relatively diverse mix of breeds. 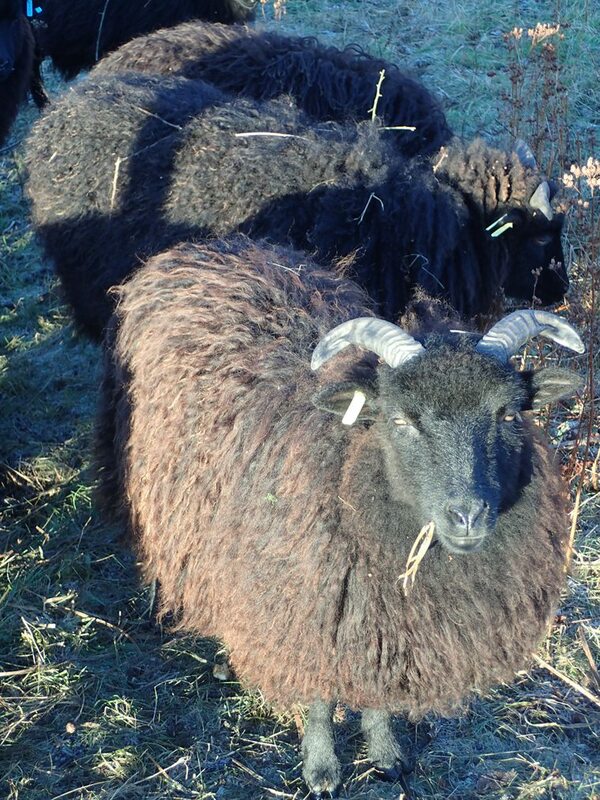 We have some rare breeds doing our grazing for us including Hebridean and Shetland. However we also use some more run-of-the-mill varieties such as Swaledale. These hill sheep are hardy if a little less specialised than some of the rarer types. We tend to purchase the smaller and less valuable whether (castrated males) from some of our local hill farms and then utilise these on our grazing schemes and, ultimately, in our box sales of shearling mutton. Some of our Swaledale flock can currently be seen grazing at Northumberland Wildlife Trust’s Hauxley Nature Reserve. Our Hebrideans have been grazing a small meadow area at Northumberland Wildlife Trust’s Hauxley Nature reserve. This is a very floristically diverse patch of grassland which has begun to start to lose its richness over recent years so hopefully the introduction of grazing should help improve this area for the future. The sheep have further grazing jobs to do on site over the months to come but the more tricky areas will have to wait until the New Year. This was also an opportunity to look at this area and the results of the grazing as an example of what could be repeated for Northumberland Wildlife Trust’s Magnificent Meadows project. In this project the grazing would be on even rougher ground but the ease at which these sheep can be herded might make some very difficult sites possible. Flexigraze CIC is a not-for-profit organisation providing conservation grazing to land managers in North East England. We also provide advice on grazing and conservation land management.